Researchers from the OPRG have also delivered funded research and consultancy projects in previous employment to the UK Fire and Rescue Service, Department of Health and the Nuclear Industry. The field and laboratory based research undertaken by the OPRG aims to develop evidence-based solutions to enhance the health and performance of personnel working within physically demanding occupations. This research typically involves measuring and quantifying the underpinning mechanisms which are then used to inform applied evidenced-based solutions which can be implemented by organisations. Our research to develop Physical Employment Standards (PES) provides organisations with a frame-work of physical tests or assessments, which are based on the demands of their job role(s). 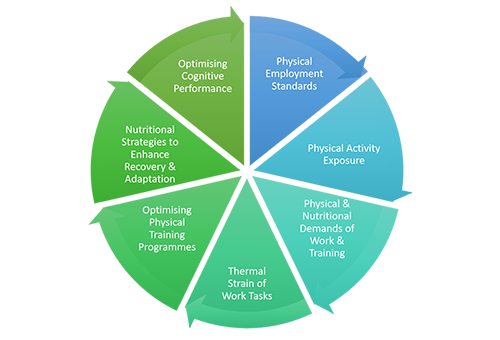 The process for developing PES typically involves four phases of research: (1) Identifying the most critical physically demanding tasks performed in a job role; (2) quantify the physical demands of these tasks; (3) developing physical tests based on the demands of the job which can be used in-service to assess serving personnel on a regular basis; (4) developing pre-employment tests to select potential applicants which are empirically linked to the in-service tests and standards. We develop and use a range of physical activity monitoring devices and techniques to measure the frequency, intensity, time, type and total energy expenditure related to physical activity that personnel in physically demanding occupations perform. These devices and techniques include heart rate monitors, accelerometers, GPS, activity watches and doubly labelled water. This data can be used to inform the dose-response relationship between sedentary or physical activity behaviours with outcomes such as the development of physical fitness assessments, health outcomes or injury incidence. We use the physical activity monitoring devices described previously alongside video analysis techniques, ergonomic evaluations and the measurement of nutritional intake, through questionnaires and/or dietary weighing, to quantify the physical and nutritional demands of the work and training performed by personnel. These data provide information on progression of training, if the energy and/or nutritional requirements of personnel are being met and identify particular activities that are associated with higher risk of injury or impaired performance. We have the capability to use telemetry pills, rectal thermistors and skin thermistors to simultaneously measure core body temperature and skin temperature of groups of up to 20 personnel in the field environment. We have used these techniques to quantify the thermal strain associated with different work-tasks and identify potential interventions to mitigate rises in body temperature. We can also view the data captured by these devices in real-time to monitor personnel during research trials or at work. Through the information gathered on the physical demands of job-roles and training we have identified two key areas where we are currently undertaking fundamental research to (1) Quantify the relationship between training load and the development of physical fitness and injury risk (2) Develop strategies to optimise the development of muscular strength whilst maintaining or improving aerobic and anaerobic capacity and muscular endurance to perform job-tasks. The high physical demands associated with work and training for physically demanding occupations is a causative factor for musculoskeletal injuries. Nutritional interventions that have the potential to enhance the recovery and adaptation of skeletal muscle following exercise may also lead to a reduction in musculoskeletal injury. We are currently developing techniques to better quantify the nutritional intake of personnel working in physically demanding occupations and investigating novel strategies to enhance the recovery of muscle following arduous exercise that may have the potential to reduce musculoskeletal injury incidence. We have the capability to measure the cognitive demands of tasks using qualitative and quantitative methods including questionnaires, interviews, cognitive tests, simulation tasks, and eye-tracking. We have used these techniques to quantify the cognitive load associated with different work-tasks including demands on memory, attention, perception, coordination, and reasoning in relation to decision making and performance. We also investigate factors that influence cognitive load such as fatigue and anxiety. In addition, we have the expertise to identify interventions than enhance cognitive performance including optimising training designs, perceptual training and simulation training.